At the Record Validation License page, you will find valuable information about your current Record Validation Edition. You can buy validation credits or refresh your license. Refresh your current active license. When migrating from free to paid edition, the paid edition will be activated and ready for use after a license refresh. Under General Information you will find important information related to your ORG and Record Validation plan. API key Your API key. Organization ID Your Organization ID, sometimes requested by our support to resolve issues. Last refreshed Last time license was refreshed. 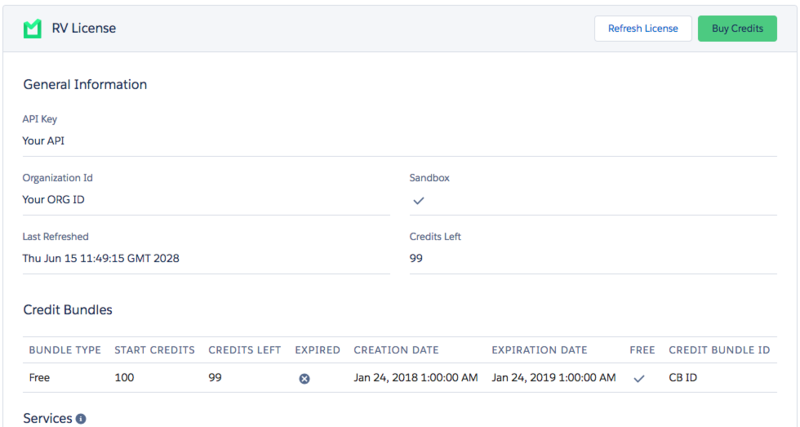 Credits left The number of validation credits left. Detailed information about your Record Validation plan, credits left, expiration date and more. Bundle type Your current credits bundle type. Credit bundle ID This ID is requested by our support upon issues. List of all Record Validation services. Check which ones are included and active for your edition and how many credits per usage do they cost.